Three intrepid helicopter pilots have set their sights on conquering the world this summer – and putting their Bell 429 to the max in the process. Bob and Steven Dengler, a father-son team with a passion for aviation, are joining forces with helicopter ace Rob “Dugal” MacDuff to fly a Bell 429 Global Ranger helicopter more than 37,000 kilometres in just over one month. It’s called the “C150 Global Odyssey” (C150GO) and is the world’s first ever global father/son global circumnavigation. The journey begins in the nation’s capital on July 1 – to coincide with the nation’s 150th birthday – and zigzags the globe after that. The crew will visit more than 100 airports in 14 countries. C150GO is a registered Canadian not-for-profit organization developed to support and raise funds for the Southlake Regional Centre Foundation and True Patriot Love Foundation. Some of the featured stops on the team’s schedule include Confederation Bridge in P.E.I., the Alexander Graham Bell National Historic Site in N.S., Signal Hill National Historic Site in St. John’s, Nfld., Marconi Centre in Poldhu, U.K. and the Canadian National Vimy Memorial in Vimy, France. 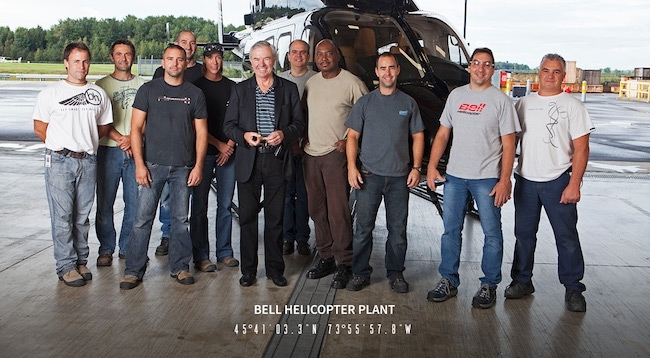 The team also plans to swing by Bell’s Mirabel facility to visit the home of the Bell 429.